HARRISBURG – The House of Representatives today approved legislation, authored by Rep. Frank Farry (R-Bucks), to protect pets left unattended in hot cars. The Motor Vehicle Extreme Heat Protection Act (House Bill 1216) would prohibit the confinement of a dog or cat in an unattended motor vehicle in a manner that would endanger the health and well-being of the animal. This violation would be a summary offense. Under the bill, a police officer, humane officer or other public safety professional would have the authority to remove the dog or cat from the unattended motor vehicle if the officer believes the dog or cat is suffering and endangered after a reasonable search for the owner or operator of the vehicle. The officer who removes a cat or dog from an unattended vehicle would not be held liable for any damages. The Humane Society of the United States, Fraternal Order of Police, the American Automobile Association (AAA), the Pennsylvania Veterinary Medical Association and emergency service organizations support the legislation and helped the lawmakers craft the language. Lawmakers and animal rights advocates teamed up for a recent press conference urging support for legislation to protect pets left unattended in a hot car. The Motor Vehicle Extreme Heat Protection Act passed the House of Representatives Friday. 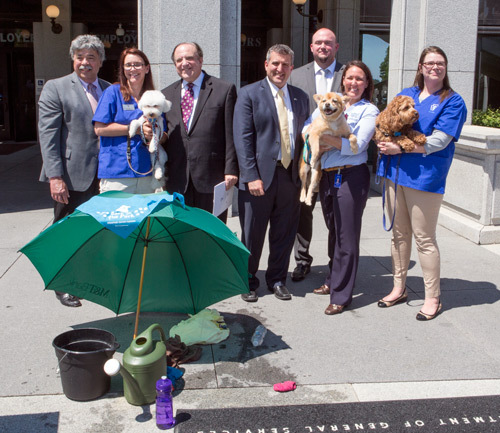 Pictured (from left) are Rep. Dom Costa (D-Allegheny); Mary Jane McNamee, JD, VMD, the Pennsylvania Veterinary Medical Association; Sen. Andy Dinniman (D-Chester); Rep. Frank Farry (R-Bucks), author of the Motor Vehicle Extreme Heat Protection Act; Kristen Tullo, Pennsylvania state director, the Humane Society of the United States; Megan Baylor, CVT, the Pennsylvania Veterinary Medical Association; and (back row) Adrian Tindell, roadside assistance manager, AAA Central Penn.